at a flat rate that won’t break the bank. We’re a professional law office exclusively focused on criminal defense. By keeping overhead and advertising to a minimum, we offer affordable representation without sacrificing quality. We don’t carry bloated marketing, advertising, or sales costs to pass onto clients. Instead, we focus on being a quality criminal defense office with excellent reputation and referrals from former clients, friends, and family. As a law firm focused solely on criminal defense, we offer services at affordable flat rates. When looking for a criminal defense lawyer, you want to pay a reasonable price, but ensure you have a dedicated and experienced criminal lawyer protecting your future, rights, and interests. Tobin Law Office is here for you. At our office, you can be confident that criminal defense attorney, Tim Tobin, will handle your case professionally, competently, and responsibly. And with flat rate pricing, there are no hidden costs, fees, or surcharges. The total legal fees are known up front, no matter how long it takes to handle your case. Many factors are considered in pricing criminal defense services. It varies on the charges, court, complexity, potential consequences, travel considerations, required expertise, and much more. For example, criminal traffic representation is less expensive than homicide defense. This is due to the difference in complexity and time involved. Tobin Law Office operates on flat fee representation, which is based on a good-faith estimation of the anticipated work. For many common charges, our fees are consistent. Fees might vary on geographic factors and anticipated ligation. The flat fee is a fixed cost for the entire case. There are no surprises or hidden costs. Clients prefer flat fees because the entire cost is known up front. No one wants surprise bills, hidden fees, or surcharges. Attorney Tobin evaluates your case during an initial consultation. Based on the charges, court, and circumstances, he provides a flat fee that covers your entire criminal case. Criminal defense is an unexpected expense. As such, we understand it’s often difficult to front the entire retainer. 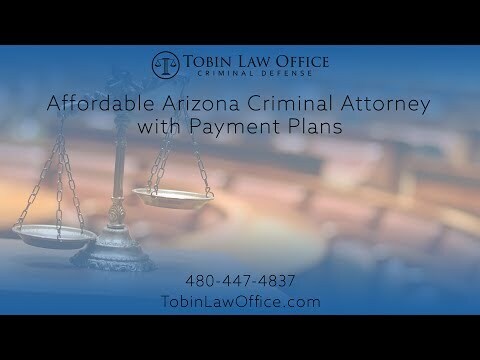 Tobin Law Office offers affordable payment plans to accommodate the sudden inconvenience of prosecution. With an initial down payment, clients can retain an experienced criminal lawyer at the onset of the case to ensure their interests, rights, and freedoms are protected immediately. Payment Plans Offered Regardless of One’s Situation. We don’t treat clients differently based on their income, assets, or background. There is also no additional cost to taking advantage of our payment plan option. We accept all debit and credit cards including Visa, Mastercard, and American Express. Card transactions can be done with installments with our professional and secure payment processor LawPay. Client can also access our secure payment portal for easy and seamless payments. With all transactions, receipts are immediately emailed to clients for their records. For clients living outside the county, state, or country, online payments are the preferred method of payment. Tobin Law Office also accepts checks, wires, money orders, and cash. Payments can be made in person, online, and over the phone. Friends and family can make payment on behalf of clients. Call Tobin Law Office for a Free Consultation and Case Evaluation. Attorney Tobin can answer questions, ease concerns, and provide a flat price. He’s glad to provide free and friendly consultations. At Tobin Law Office, consultations never involve a sales pitch or pressure to hire. Instead, Mr. Tobin evaluates your case, provides thoughtful options, and lays out potential outcomes. Call Tobin Law Office to speak with a friendly representative who can connect you with Mr. Tobin to discuss your case. No matter the time or day, someone will take your call. You won’t get voicemail at Tobin Law Office.